The suspected gunman who eluded police for 48 days after the fatal ambush shooting of a Pennsylvania state trooper in 2014 seemed surprised the manhunt, and his survival skill, lasted as long as it did, according to journals he purportedly kept while in hiding. “30 Days. A lot longer than I expected to last,” Eric Frein purportedly wrote in an Oct. 10, 2014 entry, weeks after he allegedly opened fire on Cpl. Bryon Dickson with a high-powered rifle, killing him, and wounding another trooper who came to his aid. The journal entries were read aloud to a Pennsylvania jury in Frein’s murder trial on Wednesday, which began last Tuesday, according to NBC affiliate WBRE of Wilkes-Barre. 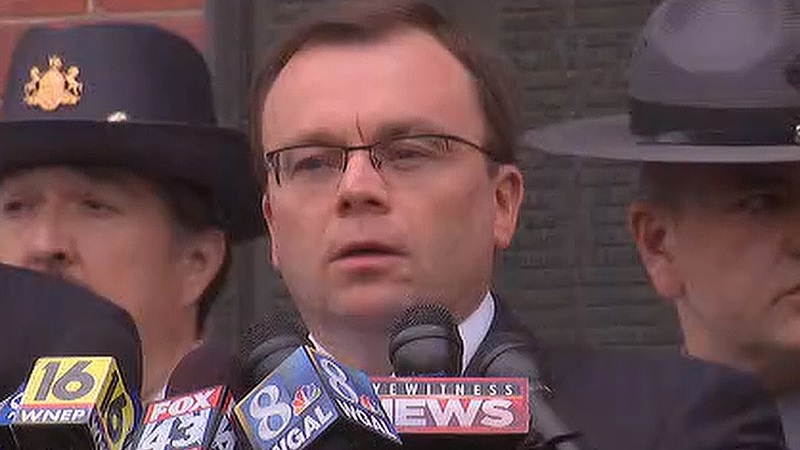 Frein has pleaded not guilty. He could face the death penalty if convicted. The notes are believed to detail nearly every single day of Frein’s movements and thought processes, according to the prosecution. The journal was found in an abandoned airplane hangar after Frein was captured on Oct. 30, 2014. In the beginning, the writing takes a lighter note of the situation — even responding to the media attention provided to its author. That entry is dated almost exactly two weeks after the shooting. “This massive search cannot last forever,” the journal then adds on Oct. 4, 2014, nearly three weeks after Sept. 12 sniper attack outside the Blooming Grove barracks. The manhunt would go on to last 48 days, and involve around 1,000 law enforcement officers and cost approximately $11 million. The search put the Poconos, including Pike and Monroe Counties, on edge with schools closed and hunting curtailed. According to WBRE, the prosecution has not linked the notes and handwriting directly to Frein yet, but they believe that it is his work. The journal first came into play during the prosecution’s opening statement. Twice they read from its pages. Frein faces charges of first-degree murder, terrorism and other charges. Defense attorneys have said he will not take the stand. If he is convicted, the jury will have to decide between the death penalty and a life sentence. In the video he described shooting the troopers, but didn’t give a clear reason for why he targeted the them. Frein finally agreed with the investigators’ statements that he did it to “wake people up” and that he wanted to make a change in government, according to the video. He said he planned the attack using Google Earth.